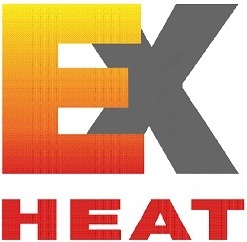 EXHEAT is a globally renowned manufacturer of hazardous area electric process heating and control systems. EXHEAT experience in producing heaters suitable for use within hazardous areas and their range of custom made heaters means EXHEAT can provide a heating solution for almost any situation. The range of process heaters and industrial heaters are designed and manufactured in the UK and with over 20 years experience the highest quality product is guaranteed. EXHEAT process heaters and electrical control systems provide hazardous area, intrinsically safe heating for Zone 1 and Zone 2 areas. The range includes in-line, air, fan, immersion and water heaters for use in both onshore and offshore applications. Process heaters are designed for common applications such as space heating and water heating and the range of heaters use an element that convert electrical current into heat. The range of heaters are suitable for use in the most challenging conditions from highly corrosive environments required the correct material properties to desert conditions where both high and low ambient temperatures must be taking into consideration. T&D UK & Exports support worldwide oil, gas and petrochemical projects with an extensive range of Hazardous Area Electrical, Mechanical, Process & Instrumentation Equipment. Efficiency – Almost all of the electricity used is turned directly into heat removing the need for tuning or additional heating. Precision – With direct heating solutions, there are extremely fast reaction times and superior temperature control giving the flexibility to deal with varying process conditions. 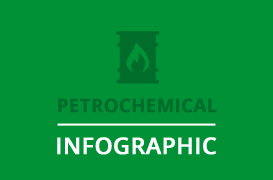 Environmental – Electrical process heaters do not produce pollutants as a by-product and avoids the monitoring and control measures necessary to meet environmental regulations. In addition, with very few moving parts, there is no concern surrounding noise pollution. Product Size & Dimensions – Electrical heaters boast a small footprint and remove the need for additional pipes or supports, therefore saving space. Costs – Being smaller in size, the initial costs are automatically lower and the near 100% efficiency levels means the ongoing costs are also minimal. Installation & Maintenance – Electrical heaters are extremely simple to install and with minimal moving parts require very little maintenance. 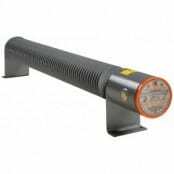 EXHEAT FWD flameproof hazardous area air heaters are designed specifically for use in small spaces, work and storage areas and are certified for use in Zone 1 and Zone 2 gas groups or Zone 21 and Zone 22 dust groups. 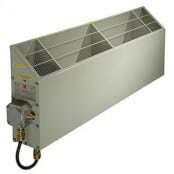 EXHEAT FWD air heater is manufactured from a fabricated carbon steel enclosure and is weatherproof to IP66. 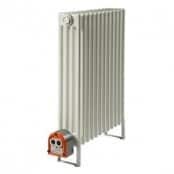 The hazardous area heater is available is temperature classes T2, T3 and T4 and is suitable for floor or wall mounting. There are many applications and industries where the EXHEAT FWD would be suitable for use including gas installations, chemical plants, offshore installations, battery stores, paint/solvent stores, sugar refineries and dusty environments. The individually replaceable heating elements make any required maintenance extremely simple and quick. 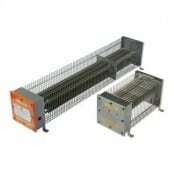 FWD flameproof heater is rated between 500W – 2kW and comes with 2 x 20mm plugged cable entries as standard. If required the heater can be controlled remotely with an EXHEAT hazardous area thermostat. Zone 1 and Zone 2 hazardous areas are classified based upon the assessment of the frequency of the occurrence and duration of an explosive gas atmosphere. Zone 1 hazardous areas are working spaces where the presence of gas or an explosion is likely to occur in normal working conditions. 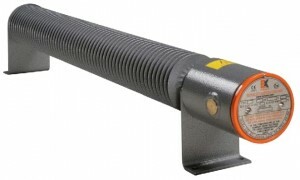 EXHEAT hazardous area and process heaters are used throughout many industries over varying applications. Throughout these hazardous area industries there are many applications that are currently using electrical heaters including fuel gas, glycol regeneration, crude oil, oxygen, process gas, heat transfer fluids, HVAC and hot water calorifiers. When working in hazardous areas and potentially explosive atmospheres, it is absolutely imperative that explosion proof and resistant equipment is used and only heaters that are certified to the applicable international standards are used in order to prevent a serious incident such as an explosion from occurring. For over 20 years EXHEAT have been designing and manufacturing the highest quality electrical process heaters and control systems. The company sets its mission statement as “To lead the global hazardous area electric heaters and control systems industry”. EXHEAT’s manufacturing techniques meet the highest requirements, design codes, international standards and client specifications. Their design processes enable EXHEAT to provide heating solutions for the most extreme applications from cryogenic service to gas regeneration.